Together, originally uploaded by [Zakkaliciousness]. I was sorting through my photo archives and I found this shot. Classic Copenhagen. 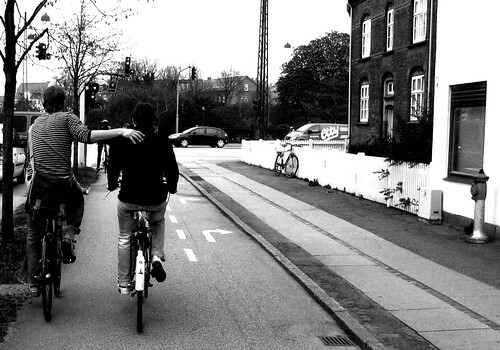 Riding in couples - with your mate, your sweetheart, your lover - is such an integral part of life. And riding on bike lanes like the one pictured is, too. You can either continue straight on over the intersection or you can choose the right turn lane. Just be sure to watch the bike traffic light, though.